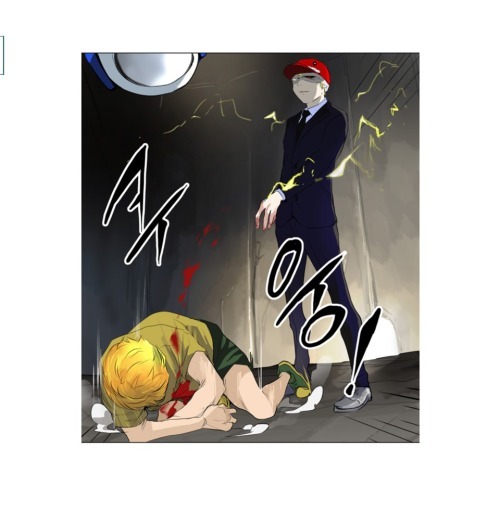 Considering I am actually so behind my Tower of God Reviews, I would first like to apologize. However, I haven’t really received any feedback from any Tower of God fans. Starting to think there aren’t that many out there. But for those that do like reading my reviews; fear not… I shall continue. So what I’m going to do, to catch up… I will review the whole Summoning Chapters in one lump, rather than doing each individual chapter. 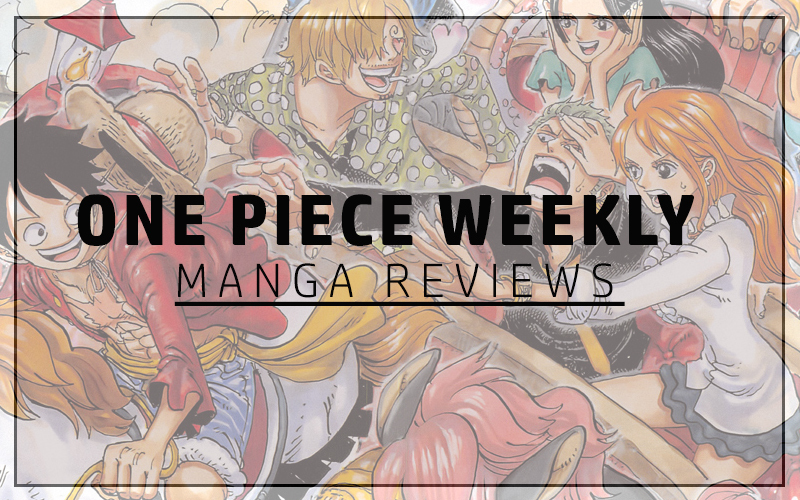 So this review will cover chapters 169-173; titles “Workshop Battle: Summoning 1-4”. Beta’s escape from his lab has become knowledgeable to the scientists that were using him as a test subject in the Acorn Workshop. Even Daft and Punk are aware he shouldn’t be there. Beta mentions having trapped Viole in an inescapable pit which begins the battle between Beta and Rak. Beta’s reason for destroying him is because of what has occurred because of him. Beta and many other test subjects went through countless experiments and many died just for his cause. Beta wants to complete it because it means Viole/Baam turns into a weapon and he will know what it feels like to sit idly by as his friend’s die thus experiencing the same despair Beta felt. Wow, this is deep! NOT! Beta is just a fool. His thoughts are derived by hate rather than reason. Before he can actually attempt to kill Rak and Yihwa, he gets a message from eyeball. Jyu Viole Grace has escaped. You should see the look on Beta’s face. He’s angry and confused but knows what he has to do. Go to the summoning station and stop the summoning from taking place. Viole is shown to be free and the thorn, in its compressed form is shown following him about. I wonder what powers it offers him? Even Hwa Ryun doesn’t know. Baam was surprised to see Hwa Ryun and learn of her role in all of this. Not even he suspected Ms. Yuto to be a disguise. She knew the betrayal plans from the start which was why she had taken these steps to ensure Baam received the weapon. 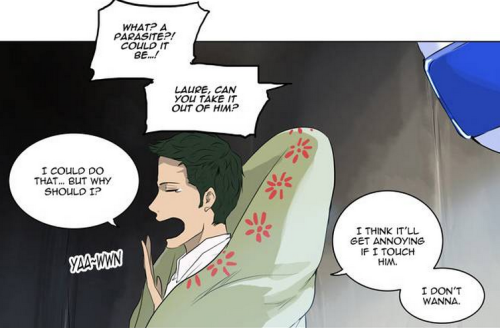 She has full belief in Baam and expects him to become ‘her God’ although Baam clearly states he has no such intention. Hwa Ryun knows he wishes to return to his friends and offers to show him the way. However she does mention that his enemies will stop at nothing to stop him from being summoned and unless he can defeat them, there is no point in returning as it will only mean putting them in danger. I don’t get this girl. She’s been helping him from the start. At first she was protecting Lahel as well as part of her team but she clearly is an ally to Baam alone. She’s part of Fug but she’s the part that is totally loyal to Baam. I think she has that revolutionary mind-set and she expects Baam to break the chains that have been set-up in the Tower of ‘God’ and she wants to help him reach the top and let them all free. Well that’s my understanding of it. With Baam adamant on returning, it’s up to Koon and the rest of his friends to ensure they go ahead with the summoning. Instead of summoning from the summoning station like normal contestants, Koon decided that they should do it from the Shop instead as to confuse those who are trying to stop them… such as Beta and Reflejo. This is because having the Thorn and becoming a weapon, he can now be summoned as a weapon. Reflejo had been waiting to stop them at the well for the summoning station. Basically, they got tricked exceptionally well by Hwa Ryun and Koon. Reflejo finds out about this and is furious. Reflejo’s list of goons, which includes “Mad-dog” (who is major scary) try to end Baam and Co before he can be summoned. They know how strong he is so they decide running would be the best option as his “Dogs” chase them, Literally as Mad-dog has shadow wolves that hunt down and kill his victims. Reflejo tries some dirty tricks and all but Rak, Yihwa and Laure end up at the shop to stop Wangnan from being killed. Laure and Yihwa combine to remove the worm that was hosted in Beta’s head and as a result he is no longer a participant. Meanwhile Wangnan recovers to summon Baam! There is a five minute loading time which Rak, Laure and Yihwa cannot buy out against Beta, who is threatening to destroy the whole shop to stop Baam from being summoned. In the end, Koon’s brilliant mind pulls through again to allow Baam to be summoned immediately. They withdraw from the match which results in the match ending and all summoning times to be removed… thus Baam arrives to stop Beta.